Initial excavation work has taken place on the new Tenderfoot Mountain Trail in Dillon. The trail now needs to be refined and completed with handwork, and volunteers are being mobilized for a construction day on Saturday morning, June 17. Volunteers are still needed for a trail construction project for a new trail just north of the water tanks and Oro Grande Trail in Dillon on Saturday morning, June 17. Last fall, the Dillon Ranger District began work on the trail, named Tenderfoot Mountain Trail — not to be confused with the Tenderfoot Trail, a one-mile hiking spun off the Oro Grande Trail — using a mini-excavator. Trees and stumps were removed and a bench for the trail was created. The Friends of the Dillon Ranger District and Summit County Off-Road Riders now need to complete handwork on the trail. This will include hauling downed trees away from the edge of the trail, dispersing the berm of soil on the lower edge of the trail, raking and leveling the trail tread to have slight outslope and feathering the backslope. 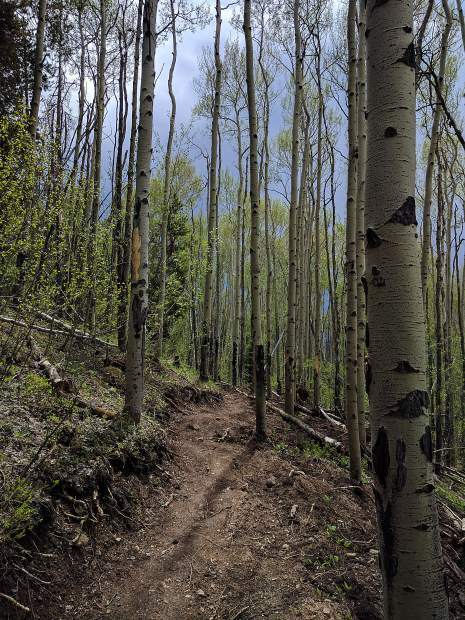 The new trail will be part of a 5-mile connection between the Straight Creek Road (County Road 51) with Tenderfoot Mountain and Frey Gulch. Those interested in volunteering are requested to sign up at fdrd.org. Volunteers will meet at 8:30 a.m. on Saturday near the Dillon water tank and hike a short distance to the trail. Volunteers are encouraged to bring a lunch, but refreshments will be provided. A tailgate party will also be held at 2 p.m. once work is completed for the day. Contact Friends of the Dillon Ranger District at 970-626-3449 or the Dillon Ranger District at 970-468-5400 for additional information.